What does the UK immigration form IS 116 look like? I just found out that the UK issues an entry form at ports of entry for holders of non-EEA travel documents that cannot be endorsed, called IS 116. What does this form look like? Couldn't find any images on the web. 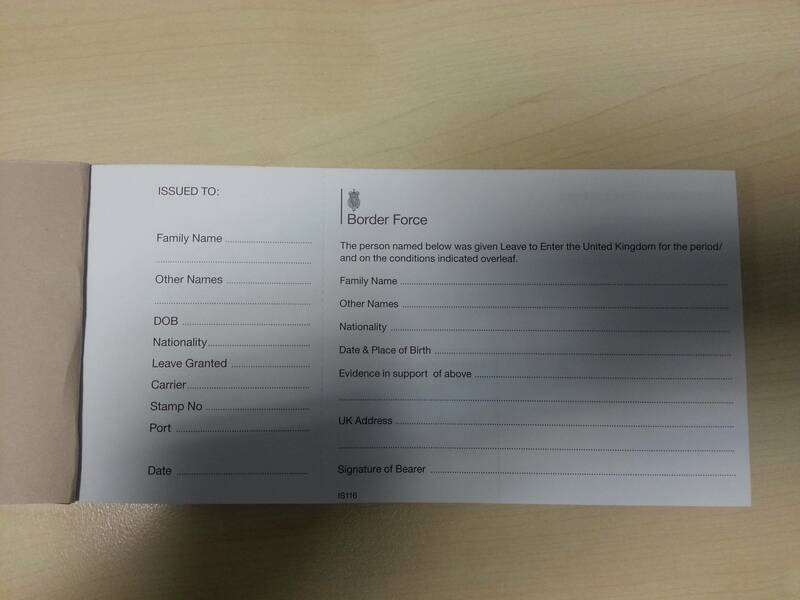 This is the front of the form (obtained through a FOI request to the Home Office). The leave conditions are stated on the rear side of the form, with the stamp being placed at the bottom right corner of the rear side. Not the answer you're looking for? Browse other questions tagged uk customs-and-immigration paperwork or ask your own question. Why do US passport cards have such limited usage? Do I have to fill out a form when submitting a blood test for a Kurdistan residency permit? If so, what details does it request? I'm travelling to USA for business (B1/B2). My wife is accompanying me for tourism with B1/B2 visa. What documents does she need for immigration? What impact will adverse immigration history have on UK visa application? How much damage (cracks) is acceptable on a national identity card before it won't be accepted? What does Mexico consider to be a valid travel document to enter and use in Mexico?